This blog builds on a research project that looked at patterns of mobile money (MM) usage for sending money “home” by Burkinabé migrants living in rural settings in Ivory Coast. The study looked at supply characteristics and households' practices in both Ivory Coast and in Burkina Faso and closely focused on conditions around sending and receiving mobile money. We found that the spatial spread of mobile money retailers in remote areas of both countries helps to overcome the migrant senders’ and remittance receivers’ lack of knowledge of the mobile phone technology. While mobile phone companies show a (very) strong interest in the development of a formal “ecosystem” to enable the usage of mobile money to perform payments and act as a payment device instead of being only a value transfer device, our study highlights an informal ecosystem to overcome the challenge of balancing monies in rural settings. In both the areas social intermediation remains key in helping users overcome the challenges associated with knowledge of withdrawal from the mobile money account. When looking at the supply side, we highlight an impressive increase in the number of MM suppliers between 2012 and 2014. This improvement in MM coverage includes the most remote localities in both countries. MM suppliers, now cover not only the sub-regional economic centers but also remote localities and even the migrant camps found in Ivory Coast. The spatial diffusion provides the infrastructure to convert cash to MM and perform mobile money transfers. In Ivory Coast, 50% of mobile money transfers are performed by relegating this task to the local MM agents/retailers. Thus, while mobile banking is supposed to enhance peer to peer banking relationships using the new technology, local MM retailers still play a key role in performing MM transactions. In Ivory Coast where the migrants live, the presence of local retailers allows the head of the family to use this new technology without having to relegate it to the younger more educated family members. This aspect allows them to maintain control over their financial decisions. In Burkina Faso, the crucial decision of the receivers of the remittances relates to from whom and were they are going to cash out remittances. However, "sending money home" via mobile phones from Ivory Coast to Burkina Faso strongly implies cashing in and cashing out CFA Francs. Deriving most part of their income from farming activities, migrants use the cash they get from the harvest to send money home. Meanwhile, remittances received in Burkina Faso rural settings are always converted to cash. In this context, most mobile money agents in Burkina Faso often end up short in CFA Francs while in the Ivory Coast the problem is where to deposit cash. 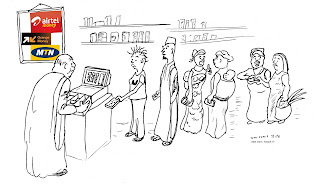 Thus, for the local MM retailer in Ivory Coast, the problem of carrying cash is considerable while for that in Burkina Faso, the issue is finding a regular access to cash. Far from a peer to peer transaction, the last mile (from the retailer to the bank and from the retailer to the end-user) is therefore of main concern here. Thus, cash is a main constraint that local MM retailers face in establishing reliability with their clients. Picture 1. Selling goods or cashing remittances out? In deciding how to send money “home” (either informally or through mobile or international services), Burkinabé migrants living in Ivory Coast do take into consideration the capacity of their local agent in Burkina to cash out the mobile money remittances. This is critical for larger sums of money (above 1 million CFA Francs). Therefore, the issue of the last mile deals mostly with the ability to balance CFA Francs with mobile money. In short, in Burkina Faso, local mobile money providers have to find a way of balancing the two monies to be able to provide remittance services to the local population. Our findings in the regions where we conducted the research highlights that mobile money agents often combine mobile banking services with commercial activities involving buying, selling, and trading goods. The location of MM providers according to different selling point characteristics is illustrated by the figure below, built from our own census in Burkina Faso where the study was conducted. It is striking that in Ivory Coast only 12% of the MM providers are shopkeepers while this is the case for 50% of local MM providers in Burkina Faso. The difference can be explained by the fact that in Burkina Faso, the selling goods activity is key in the delivery of international remittances since access to cash is ensured by buying and selling items which then allow cashing out of MM remittances. In remote villages, MM services are exclusively provided by shopkeepers. MM transfers are also provided by local shopkeepers who do not own a MM seller sim card and instead make use of their own sim-card to perform remittances withdrawals. Accessing cash in remote areas also implies managing security. The problem is the following: a selling point in a remote setting faces difficulties supplying the necessary cash for large withdrawals because of a lack of access to large amounts of cash. To overcome this constraint, one strategy we found in this region is that the shopkeeper uses mobile money to buy goods in semi-urban settings, from a MM dealer who is also a shopkeeper. This enables him to reduce his mobile money by getting goods. He then sells these items, converting them into cash, which is available for future mobile remittances. In this context, the linkage with cash remains an important challenge to strengthen MM services in rural areas. 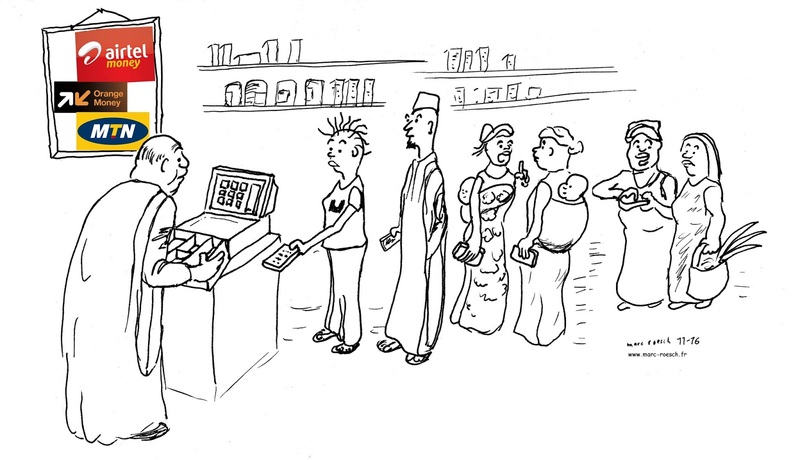 Buying goods with mobile money enable the MM selling point to balance the cash-in and cash-out transactions. This may also explain why mobile money remittances target semi-urban areas instead of directly reaching rural ones as well as the frequent use of intermediaries. Actually 50% of the transfers first go through intermediaries before reaching the end-beneficiary. Beyond local MM agents, intermediaries involve people from the extended family who are able to master the new technology and access cash (again) such as young students (female and male) in Ouagadougou. Usually these students come from Ivory Coast to study in Burkina Faso where they play a central role in strengthening the ties between family members in Burkina Faso and the migrants in Ivory Coast. Cashing out remittances and delivering them is a key task they perform. In addition, the other similar central figures (masculine) are the uncle or the brother. These intermediaries are also instrumental when the recipient lacks a MM account, which according to our interviews is unrelated to mastering the technology since “the local agent can help!” Most transfers are performed at the MM selling point. This is illustrated by a young female student who formerly was in charge of carrying the money sent by her father to her grandma, but she says that now she has her own account. Finally the cashing out constraint is illustrated by the percentage of remittances sent by mobile phone that reach semi-urban regions compared to the number of traditional sending services that do. Mobile phone companies show a (very) strong interest in the development of a payment platform to enable the usage of mobile money to perform payments and act as a payment device instead of being only a value transfer device (not only able to perform transfers but also to perform payments). In Burkina Faso, mobile money is not yet a means of payment because of the limited scope of the payment platform. However, some local usages by the shopkeepers allow its usage as a means of payment. Our findings show that the situation in Ivory Coast and Burkina Faso is still mainly driven by cashing in and out CFA Francs instead of making direct use of MM. In that context our study shows that the diffusion of mobile money services (mainly used to perform national and international transfers) in rural settings is closely shaped by the provider's ability to access cash. Shopkeepers are therefore key in this process. This capacity of converting mobile money into CFA Francs might also limit the expansion of mobile money usage in rural settings. Finally, in contrast to what is being argued in the literature, use and ownership of mobile phones do not play a central role in mobile banking usage and uptake to perform remittances within the context we focussed on. The lack of knowledge and lack of mastery is partially compensated by relegating the task to local retailers and/or social intermediaries. Our aknowledgements to IMTFI team for constant support and relevant feedbacks to earlier version, Marc Roesh for the comic and Joshua C. Greene, for the editing.